Hyabak Capsules are a dietary supplement containing Omega-3 and Omega-6 essential fatty acids, vitamins and minerals with anti-oxidative properties to help maintain vision and reduce the symptoms of dry eye. Omega 3 has been found to have many benefits to the eye, brain and also the joints. 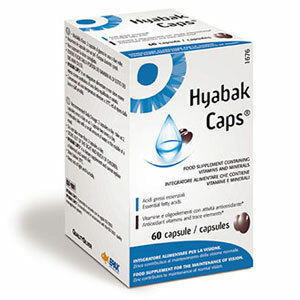 Hyabak Capsule contain Fish oil with 70% Omega-3 and Borage oil with 22% Omega-6 the optimal combination that is believed to be most beneficial for dry eyes.